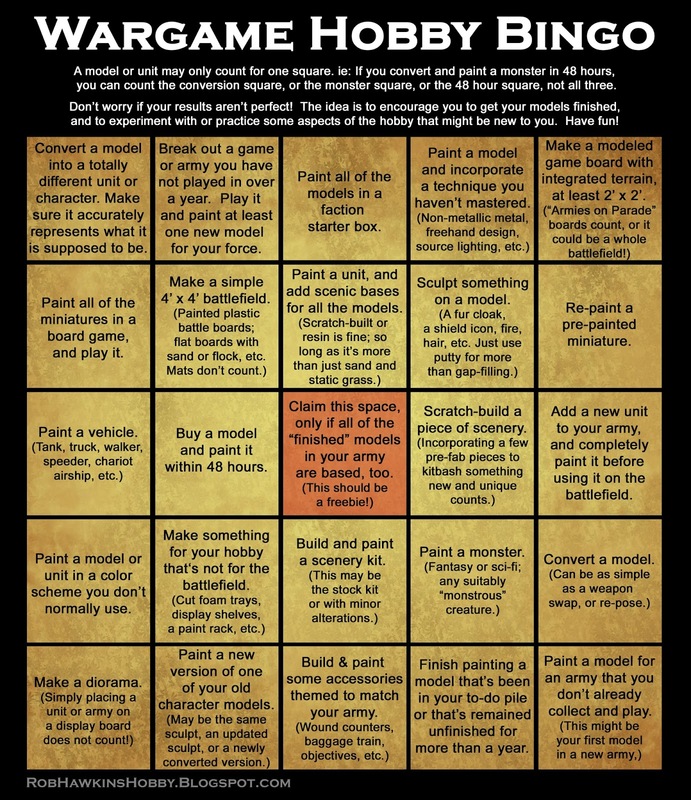 I was inspired by Martin Lymer's awesome Miniature Painting Bingo card, and decided to make a Wargame Hobby Bingo card that expands beyond painting to encompass more aspects of tabletop wargaming like building scenery and modeling. The idea is to motivate hobbyists to get their models finished, and add a little creativity and uniqueness to what can sometimes become a monotonous slog. Or, if you're stuck trying to figure out what to do next for your army or tabletop, look to the card for inspiration. Track your progress over the course of the year, and try to score five in a row. Or go crazy and try to fill in the entire card! Models don't need to be newly purchased (except for the 48 hr challenge), this is the perfect opportunity to clear out your painting queue or finish models you've been avoiding painting. This should be a freebie for everyone. Models aren't finished unless their bases are done too. If you've got unbased models, base 'em, and make sure the models you paint for the card are based too! Pretty straightforward– Transform a model into something it wasn't intended for. 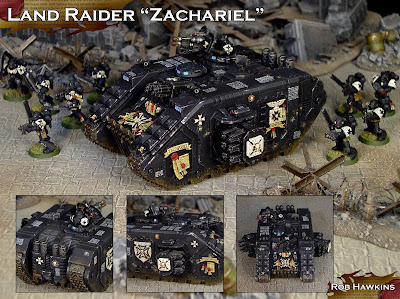 This can be a cross-genre conversion, like turning a 40K zealot into a necromancer or zombie, or "orkifying" a Space Marine dreadnought into an Ork dreadnought. Some actual conversion work may be required; The rule of thumb is to make sure that the final model accurately represents what the new model is supposed to be. I do this quite a bit, and I'm sure I'll have plenty of opportunity in the coming year I've got my eye on a Nightbringer-to-Mourngul conversion, but I want to see how the Age of Sigmar Death alliance shapes up this year before committing to it. 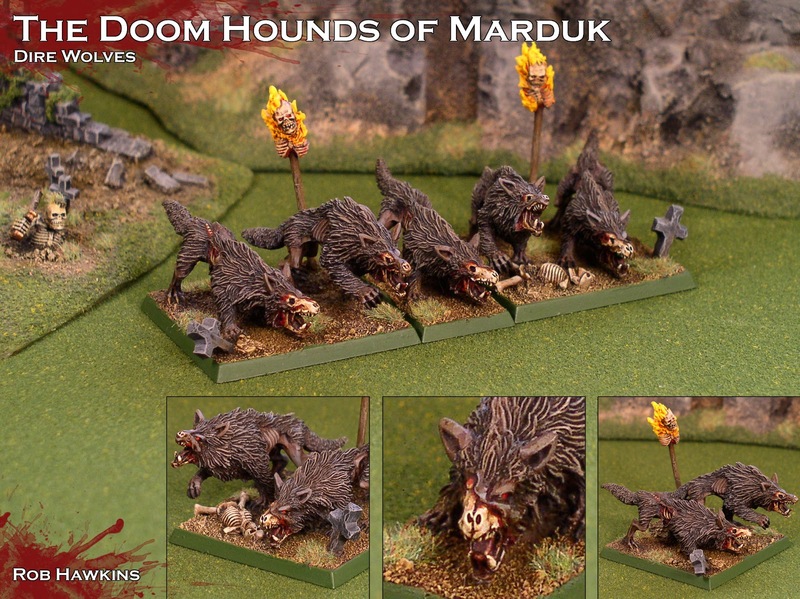 Dire Wolves converted from Chaos Hounds. Have an army that's been languishing in its miniature case, or a game you barely play anymore? Use this opportunity to break it out and use it. Since this is hobby-oriented, you need to add at least one new model to your force. For me, My Necrons are the only army I haven't touched in ages. I might be tempted to put them on the table and paint a unit or two. I also haven't played Space Hulk all year, maybe I'll play that and finish painting the Genestealers. Try something new, or hone your skills. The only way to get better is to practice. Don't worry if it's not perfect, it never will be unless you try, and practice, practice, practice! This might be a tough one, but work on some terrain. This can be a fully modeled battlefield (if you're insane like me) or a small section of a battlefield that you can tile into your game board. If you participate in tournaments or Armies on Parade, making a nicely modeled display board for your army will get you this square. I'll probably be building plenty of game boards this year. 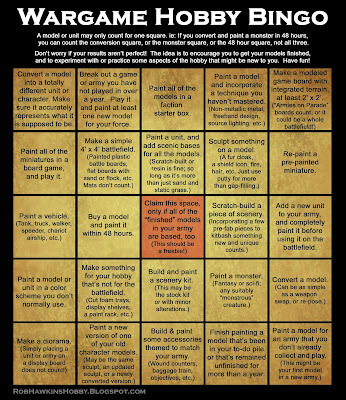 Doesn't need to be fancy, but because this is hobby-focused, it can't be a gaming mat. Painting GW Realm of Battle tiles works, or you can make some simple sand-and-flock game boards. I've got a tutorial coming up that will show an easy way to make a game board, stay tuned! 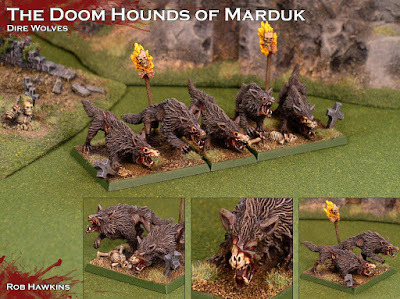 If you already do this for your army, you're ahead of the game, but this could be the perfect opportunity to make an elite unit stand out, or to create some centerpieces for your army. You can use pre-made resin bases or model something cool to make your dudes stand out, it just needs to be more than boring sand and grass. I put most of my models on scenic bases. I've got something cool in the works for my Primaris Imperial Fists' bases. This base took longer than the model! An opportunity to practice sculpting details on models. This can be as intricate as you want, or if you're new to sculpting, keep it simple and just add a few pouches or some hair or chain mail. Not sure what I'll be working on this year, but I bet some sculpting will be inevitable. An opportunity to customize some X-Wing models or spice up those factory paint jobs. 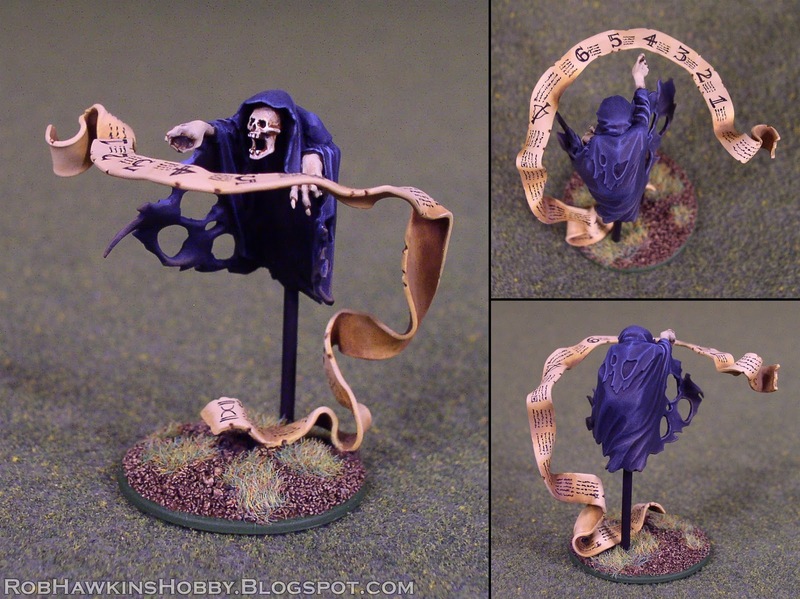 I guess this could also technically count if you buy a model someone else had painted, strip it and paint it yourself! Not sure what I'll do to fill in this spot, as I don't usually play pre-painted games or buy painted miniatures. These apply to both sci-fi and fantasy games. A chariot or black coach is just as much a vehicle as a tank or speeder is. If you're catching up on a Dreadfleet box, those little ships would count! Likewise, a Tyranid Carnifex is as much a monster as a zombie dragon. I hope there are some new releases for the undead, because I'm pretty much out of monsters to add. I've got plenty of vehicles to add to my Black Templars and Imperial Fists. Don't let your models languish! Get a new model and paint it right away. If I can build and paint a Skaven Doomwheel in 24 hours, you can paint a single hero in 48 hours! Definitely going to make an effort to fill this box this year. Make some scenery! The first one is for painting a stock (or mostly stock) terrain kit. And the second one is for getting creative and either kitbashing something unique or building a piece of scenery from scratch. If you're looking for ideas, check out my Terrain Tutorials. I've got the bell from the Screaming Bell that I want to make into a piece of inspiring terrain for my Skaven. Try something new and add a little variety to your routine. Most of the models I paint are black and red, black and white, grey and brown, or green and brown. Pretty drab. I'm looking forward to using yellow on my Imperial Fists this year for a nice change of pace. Keep it simple. Only needs to be a head or weapon swap to count. I hardly field any models "stock" anymore. This is an opportunity to update an older character, maybe as a variant with some different weapon options or a mounted/ dismounted version, or simply because your skills have grown and you want to replace an older model. I've done this for many of my Vampire Counts characters. Could this be the year that Nieman Kimmel finally gets a new model? Themed accessories are always fun to build and make the tabletop experience more interesting. Scenic wound counters rather than dice, some army-themed objectives, or a turn counter. My undead and Skaven are pretty filled out in this regard, but my Space Marines could use some accessory-love. Originally made this as a spell tracker, but now it's my turn counter. We've all got them– Projects that we push to the back burner and then never return to. Take the opportunity to finish a model from your Shelf of Shame! I have plenty in this category. Looking at you, battle standard bearer! It can be difficult to branch out and paint other models that look enticing, but that we won't play with. This is the perfect excuse to paint a model just for the hell of it without committing to building an entire army around it. Or, if you are starting a new army, the first model for it can count for this spot. And that's it! I'm going to make an effort to try and fill in the entire card. How many do you think you'll do? Go for that bingo, and have a Happy New Year, everyone! Great!thank you, I hope that it will help me having a good 2018 year! Have a happy new year too! This sounds like a fun way to spend the year. I've just started the clock on my '48 hours' model and have plans on what to do for a few other squares. Not sure if I'll manage a full bingo any time soon, but ticking off more than half the boxes is fine with me.